1. No plan to follow. 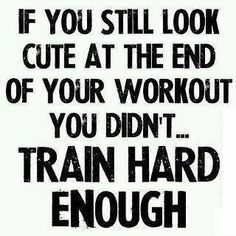 How many folks do you see in the gym wandering aimlessly from machine to machine, or doing randomly combined exercises and looking lost at the end of a set? My guess is the vast majority. These folks get no results, because they literally have no idea of where they want to get to, never mind how to get there. Find a plan, (the internet has approximately a gazillion), or get a trainer and follow his or her plan for you. All the way through. Don’t stop after a week and switch to something different. See the plan through and then, and only then, move on to the next stage of training. 2. Not pushing hard enough. Training sessions don’t need to have you lying on the floor at the end feeling burst and feeling like you are gonna puke your pre workout all over the floor. However, you should feel like you have done some actual, good, hard work and achieved something during your sessions. If you leave the gym having not broken a sweat or struggled at least a little to get to the end of a set, then you’re not doing yourself any favours. Challenge your limits. Sweat a little, it won’t kill you to get out of breath and sweat. 3. Not recovering well enough. Training is awesome, you get stronger, leaner and fitter, it can boost your confidence and mood, and improve you mental strength, whats not to love!? However the stresses you put on your body to enable all these wonderful things needs to be dealt with to allow the adaptations and improvements to be made to allow you to be better able to handle the next round of stresses. This is where good food, good sleep, staying hydrated and foam rolling/ massage etc come in. Take some time off and your progress will be a lot faster than if you don’t. Trust me when I say that if you don’t, your body will force you to eventually. I usually suggest no more than 2 days training followed by a recovery or active rest day. Hope this helps you start to make the necessary changes to your training to get the best out of it. Any questions, please just ask!